Tonight is the first of the free public star parties hosted by the Kern Astronomical Society for 2018. This year, KAS will “spread the wealth” of star party experiences by hosting the public star parties at three different locations. Tonight the star party will be at the Park at River Walk near the main entrance to the park. Viewing through the KAS telescopes will be from 8 to 10 p.m. Next month the public star party will be at Barnes & Noble and in June, KAS will be at Panorama Park. The complete schedule with maps is posted on the KAS website at kernastro.org. The moon will be one day shy of first quarter phase and it will be right next to the string of stars that belong to Pollux, one of the Gemini twins (see the star chart below). Near the 8 p.m. start time of the star party, you may be able to view Venus low in the west right below the Pleiades star cluster at the shoulder of Taurus. Through the KAS telescopes Venus will appear almost full phase. Through binoculars Venus and the Pleiades will be just barely within the same field of view. 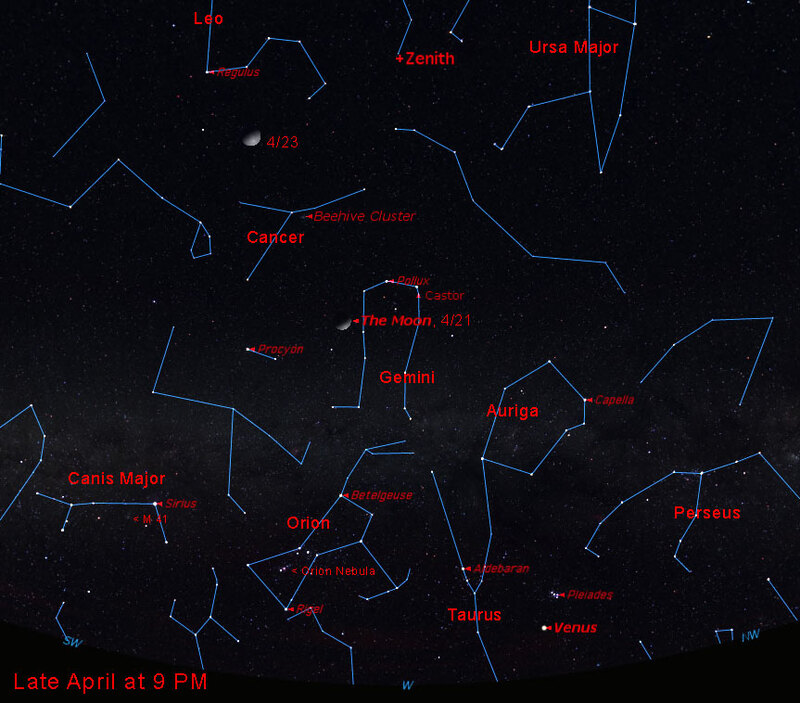 On April 24 they will be at their closest separation, easily fitting within the same field of view of your binoculars. Higher up above the moon tonight will be the Beehive Cluster at the heart of the dim constellation, Cancer. Tomorrow night the moon will be right next to the Beehive. Near the end of the star party you might be able to see Jupiter peeking above the mountains and the dust-smog layer in the east. Jupiter is in the middle of Libra. Jupiter will be up highest due south around 2 a.m. Other things to check out in the KAS telescopes will be the Orion Nebula in middle of Orion’s sword and the M-41 open cluster at the heart of Canis Major. High up in the northeast below the handle of the Big Dipper part of Ursa Major you might be able see the Whirlpool Galaxy but there might be too much light pollution to even see it. After midnight tonight and tomorrow night, you might see a few meteors of the Lyrid meteor shower. In the world of science communication, I’m going to miss the 13.7 cosmos & culture blog/podcast that has been on National Public Radio. Started by astrophysicist Adam Frank and physicist Marcelo Gleiser, it is ending its seven-year run as a place where scientists could give their views on the “deepest and most potent issues facing humanity” and “how science worked as a force in all our lives” for good or bad. Dr. Frank was two or three years ahead of me in grad school at UW. Anthropologists, psychologists, and historians of science were other contributors. Go to www.npr.org/sections/13.7 to read past entries. It is well worth reading. Another great science communication site is Science Friday on NPR that is broadcast on Friday 11 a.m. to 1 p.m. and archived at sciencefriday.com . Last week’s episode had a segment about SoCIA 2018, a conference on social and conceptual issues in astrobiology held last weekend. SoCIA looks at the broader impacts on our society of discovering extra-terrestrial life, particularly intelligent extra-terrestrial life. With over 3700 confirmed exoplanets, most scientists involved in the exoplanet research think it is a matter of “when”, not “if”, we discover extra-terrestrial life and the “when” is expected to be within the next three decades. There were sessions at SoCIA on METI–Messaging Extra-Terrestrial Intelligence along with the usual SETI. We have been leaking radio transmissions almost continuously for over a century now but the intentional beaming of messages to particular locations in the galaxy is newer and done irregularly in single bursts separated by long time periods. Recognizing that we don’t understand the vocalizations of other intelligent mammals (heck, we have a hard time understanding other humans who speak in a different language! ), how should we craft an unambiguous message to creatures that might not even be based on DNA? Should we even try? Are there truly universal principles of biology, psychology, morality, etc. that would apply to extraterrestrial life? The guests on the Science Friday episode gave a sampling of the ideas that were being shared at SoCIA. Go to sciencefriday.com to listen to that segment. Another interesting astronomy story has been the “little galaxy that could”: a diffuse galaxy called NGC 1052-DF2 that formed with very little, if any, dark matter. Every other galaxy we see is just the “tip of the iceberg” of a concentration of dark matter. The discovery shows that dark matter can be separate from ordinary matter which also shows that dark matter is not just an artifact of our misunderstanding of how galaxies are put together. NGC 1052-DF2 is also unusual in that its globular clusters (spherical, tightly bound star clusters made of hundreds of thousands to millions of stars) are about 1000 times bigger than the usual scaling relationship between the mass of globular clusters and the total mass of their host galaxy. That doesn’t fit our galaxy formation theories. That’s another puzzle for our future astronomers graduating from high schools and colleges to figure out. With a universe to explore, astronomy has great job security.